September 4, 2014 -- There may be folks out there who have heard our story through our series of articles, or who have had the chance to hear us speak. Either way, we hope you enjoy and benefit from the education we offer. If you are new to us, I (Doug Wuebben) am a practicing echocardiographer who does pediatric and adult scans. Some years ago, I suffered daily from debilitating shoulder pain, a direct result of performing my job. 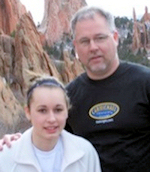 Doug Wuebben and his daughter. Luckily, I had access to a helpful friend and colleague: strength, conditioning, and performance coach Mark "Coach Rozy" Roozen. After I spoke with Coach Rozy about my pain/injury issues, he first looked at the body movements required to perform the tasks of a sonographer. He then prescribed a simple set of exercises and stretches that completely eliminated the pain. I still follow the routine to this day, and I have no pain. As Mark and I travel to present and share our information and training program, we see the exponential increase in demand for this type of education, which is lacking and yet so necessary. We're proud and honored to be able to help folks learn how to deal with their pain and job-related injury issues. AuntMinnie.com has been a great partner in getting the information to sonographers around the globe. Through its reach, we've been able to connect with people around the world, including Bernadette (Bernie) Mason, a senior lecturer and clinical site supervisor with the Australian School of Medical Imaging (ASMI). Bernie was introduced to ultrasound in Australia in the late 1970s and early 1980s. Building a friendship through the magic of the Internet, I learned that she educates sonographers in Australia about proper ergonomic protocol to reduce their pain/injury issues. Communicating back and forth, it was evident that Bernie and I had many things in common, not the least of which was job-related extreme pain and injury. My name is Bernadette Mason. I had a very exciting career, starting with nuclear medicine. Part of our training at the time was an introduction to some components of ultrasound. My interest in ultrasound grew, and I made the decision to take career advancement and make ultrasound my full-time career. Sonography was a new and exciting field. After starting my family, I cut back my hours to four days per week, along with locum assignments. I found this to be a very challenging move. The stress levels were enormous. I needed to prove that I was a worthy sonographer, and my employers needed me to perform an adequate number of studies to justify my employment. As the years went by, my patient list began to increase. I enjoyed challenging myself to do more studies on patients than I had done the day before. My employers also encouraged me to complete more and more studies every day. Eventually, I reached the point where I was so busy fitting in the next patient that breaks became a thing of the past. My back started to ache and my neck became painful, causing headaches to begin and then worsen. I was also busy raising a family, so in between weekly visits to the physiotherapist I became Wonder Woman and learned to work everything into my day. I didn't realize at the time that I was putting my health and my body at risk. I was exercising, and my attitude was that I could handle anything that life threw at me. Due to my work ethic and ability to be a "high-output" employee, it became the norm to put "urgent" patients on my list. Breaks were a luxury, and I felt I owed my employer effort to meet their expectations. In Australia we have a saying: "She will be right, mate." That is what I firmly believed. Soon the pain in my neck became constant. My back suffered the same. I was stiff and sore even after a good night's sleep. My reaction was to swim more and just keep going. I reached a point where my back started to spasm, and the physiotherapist advised more exercise and stretching to alleviate my pain. Great, I had to fit more into my already busy work week. I believed that I could do this on my day off and perhaps three or four nights per week. Physiotherapy is not cheap, which caused stress on the family budget. This precipitated me to work more, further aggravating my problems. A vicious circle. The turning point for me came around Christmas, a time when staff members take time off for family. This leaves a department with the same workload, yet fewer people to do the work. My workload increased during this period. It was at this point that my back went into a severe spasm. I added another medication in an attempt to control the spasms and the pain. My sister had also been diagnosed with terminal cancer, adding to my stress. On New Year's Eve of that same year, I experienced the worst pain of my entire life. I popped a disk in my neck and passed out. My employer at the time was very sympathetic and did a CT scan, and I was sent home with more medications. I was told that I was too important to be off for an extended period of time. At this point in my career, I had popped two disks laterally and had three bulging disks. My employer soon sold the practice, and the new operators had me try office work. My injury level had become so severe by this time that I was unable to complete the office work. An unsuccessful attempt was made at workers' compensation, but eventually I was terminated. My stress level was through the roof; I was raising a family with all the bills and life expenses that that entails. I was severely injured with no known prospect at that time for relief. I had given my blood and guts to the company, and when I didn't work out anymore, I was booted to the curb like an empty soda can. There was nothing left but tears. I took matters into my own hands and eventually found a representative to take on my case. The courts took a look at my case and decided that the fair and just thing to do was award me compensation for my years of service, dedication, and hard work. I had a normal CT scan of my neck taken years before for an unrelated issue. This was the "smoking gun" that let the courts award me a victory. I was still debilitated, neck brace and all, but I felt somewhat vindicated and recognized for my hard work and years of loyal service. During this time in my life, a friend told me that a sonography school was set to open, and that I should consider applying as a professor. I feel very fortunate to have been hired to teach the ultrasound program. I continue to have a lot of pain and some disability, and to some degree I still worry about my income and even my ability to continue working. I've been told that I suffer from a form of post-traumatic stress disorder and am working out the details on how to deal with that. I am also very proud to mention that I did go on to obtain a master's degree in adult education. I am on the Australian Sonographers Association Health and Well-Being Committee. My goal is to educate sonographers all over the world with my story. I don't want anyone else to endure the pain, agony, frustration, and stress that I experienced. I can also be a leader in educating folks on the proper steps, should they find themselves in a similar situation. Working harder and taking more pills is not the answer. Australian sonographers suffer from a 25% rate of career-ending injury. I am one of them. This cannot go on. Things have to change. Thank you for hearing my voice. We would like to thank Bernie for sharing her very powerful story. Bernie's pain and injury forced her to elevate her life in ways that she probably didn't realize she had available in her inner spirit. Unfortunately, Bernie's story in the sonography world is not uncommon. Every single time Mark and I present at a conference or educational event, sonographers approach us with similar stories in which people are in critical, near-debilitating pain with an injury that threatens their very livelihood. Every time. Most of the time, you can see and feel the pain with the tears and anguish that follow. Bernie knows. I know. Bernie suffered horribly but was able to move on. I was at the same place, but with the luck of having a friendship with Coach Rozy, I found help and complete relief. Two similar beginnings but with completely different endings. If you are a sonographer with this type of story, we want to hear it. Send us an email and let us know your story. It might not be too late to change your course and travel down a new path, a path that you have control over. The educational material that Mark offers is a philosophy of training movement. You train a professional football player's body to play the movement game of football. Likewise, you train a sonographer to condition his or her body as a sonographer, performing body movements and working through positions that sonographers do while working. In future articles, we will keep sharing our tips for doing the right moves (exercises, stretches, etc.) the right way. We also want to expand on the rights and responsibilities of employers and employees. If your job is causing you pain and injury, your employer has certain responsibilities in those areas. Our experience tells us that most folks aren't aware of this. There is more to come on that topic in future columns. Doug Wuebben is a registered echocardiographer and also a consultant, national presenter, and author of e-books in the areas of ergonomics, exercise and pain, and injury correction for sonographers. He has also been published on the topics of telemedicine and achieving lab accreditation. Mark Roozen is a strength coach and also the owner and president of Performance Edge Training Systems (PETS). Wuebben and Roozen are co-founders of Live Pain Free -- The Right Moves. Email livepainfree4u@gmail.com for more information on programs or speaking requests or with any questions or comments. The comments and observations expressed herein are those of the authors and do not necessarily reflect the opinions of AuntMinnie.com.